Plasma Cleaning of Ti Alloy Surfaces. Here is a research paper by our Customers at Orthobond Inc: Jordan Katz, Sophia Gershman & Abraham Belkind. Click here to view this good work. 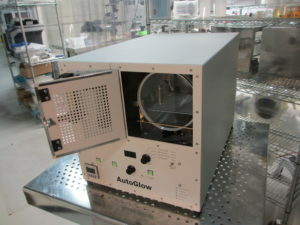 The Glow Research AutoGlow plasma system was used for some of this work. Plasma cleaning is common in the preparation of titanium medical devices. 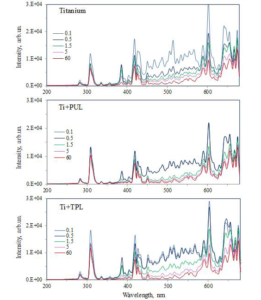 In this study, we examine the use of continuous in situ measurements with optical emission spectroscopy (OES) during plasma cleaning and wet contact angle as a tool to assess titanium implant cleanliness. Plasma cleaning was performed in argon plasma at 66.7 Pa in a commercially available radio-frequency (RF) power plasma system using 25 or 100 W of power. During cleaning, the intensities of OES lines at 386 and 418 nm, as related to surface contaminants, decreased over time and reached a baseline level in ~1 h. However, the water contact angle (WCA) decreased more rapidly, reaching ≤10 degrees in 3–5 sec and further decreased to the limit of detection of ~1 ± 1 degree in 20 min using 25 W plasma and in 1 min using 100 W plasma. The OES data indicate that plasma cleaning starts with rapid removal of contaminants from pronounced regions that are better exposed to the plasma and is followed by prolonged cleaning related to the removal of contaminants from less accessible regions. The delayed rise in WCA demonstrates a limitation in using that technique to assess cleanliness and shows how OES is a useful tool to better understand and control plasma cleaning of titanium surfaces. foil. 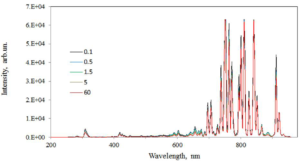 Spectra recorded during cleaning at various indicated plasma exposure times (min). during cleaning at various indicated plasma exposure times (min). CP Ti foil. 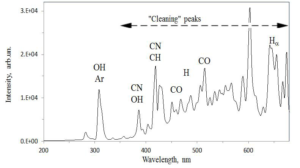 Spectra were recorded during cleaning after 5 s of plasma exposure time. Probable emission peak identifications are shown in the graph. systems, and are not applicable for routine control of metal-surface preparation. durations of Ar plasma, thus demonstrating that a contact angle of 0 is not an appropriate measurement to ensure that a Ti part is completely cleaned. In medical applications where robust cleaning is essential for success, OES may be an appropriate tool.